1. Decorating rocks for use during weekly joys and sorrows. /2. Roasting marshmallows out at Horses of Course /3. Joys and sorrows basket./4. Teens participating in the Log Challenge at Camp Wyoming /5.Sunflower Ceremony/ 6. Stained glass window/ 7 Lucia & kids sing “All Earth’s Critters” /8. Making blankets for Mnt. Pleasant /9. Our interconnected web! During one of our first children’s services, we made tissue paper “stained glass” windows on the glass doorways in the lounge. The kids decided that they wanted to add words of their choosing. As we move into this new year, I want to share with you some of what has been happening in our Village. 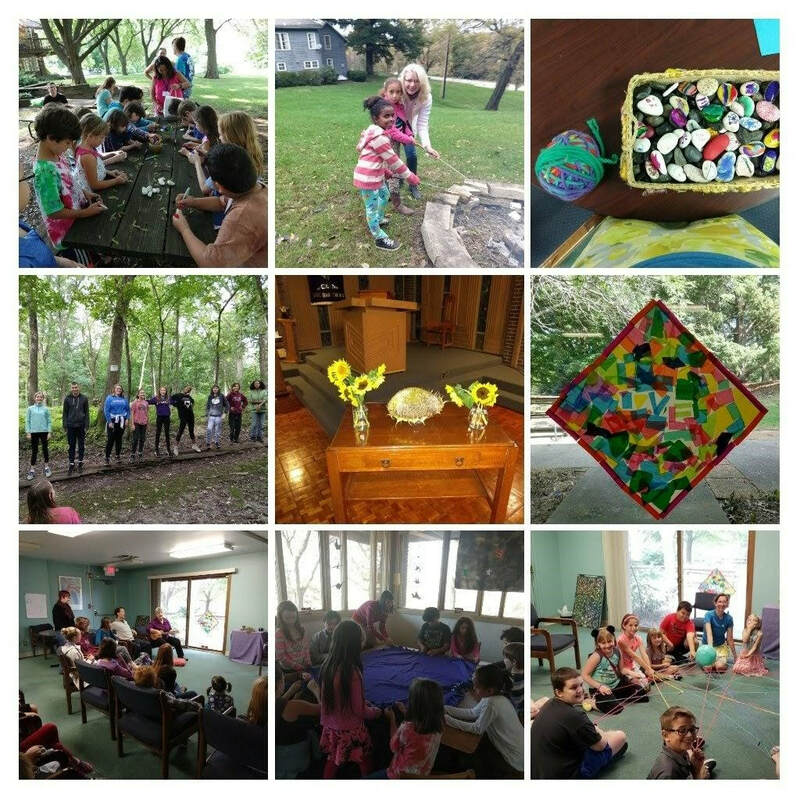 The past months have held a teen camp-out, all ages horseback riding, several intergenerational services, marshmallow roasting, tie-dying, blanket making, countless “balloon breaths”, tree climbing, a Halloween Carnival, monarch releasing, community building, song singing, and lots of learning about our beautiful religion. We have also been experimenting with beginning the hour of service with the kids starting downstairs for their own short children’s service instead of starting in the sanctuary for Words for All Ages. It is our hope that the kids are forming an appreciation and ownership of ritual and sacred community. The services consist opening words, chalice lighting, mindfulness practices, joys and sorrows, a brief lesson on a principle or source, closing words, and extinguishing the chalice. Reverend Jay, the RE team, and I would love to hear any feedback you have about this change. In addition to these usual service elements, we also have two wonderful musical volunteers, Lucia Dryanski and Lorna Johnson, who are song-leading with the kids. In March, we will have an intergenerational music service, and you’ll be able to share in some of the hymns the kids are becoming familiar with. Parents have received an email regarding the addition of one Cooperative Sunday each month, which will consist of a short Children’s Service with a focus on a principle, followed by a variety of fun activities related to that message (art, games, etc). If you are not already leading classes, your help will be needed during these Sundays to implement the fun! Please see below to sign up for something which interests you. If you have any ideas that match up with our themes, please feel free to add to the creative energy by planning a short (10-15 min) activity! As UUs, we are able to discern what words and prayers are meaningful to us, without someone else telling us the “right” ones. Today, we will write our own blessings by making lists of words that hold meaning for us- whether the word is “Minecraft” or “sunset,” we are the ones who get to say what words belong in our blessings as we move forward in our search for meaning. Come help with decorating the social hall and lounge for our Valentine’s Dance! We will be organizing a volunteer social justice activity and creating Valentine’s notes for each other. This is a community building Sunday and a great chance to practice kindness in our relations while serving our church community, larger community, and the beautiful web of life. As always, thank you for building this vibrant community together. As your DRE, my proverbial door is always open for questions, ideas, concerns, and communion. Celebrating the Winter Solstice. “Here Comes the Sun.” (doo, doo, doo, doo) Earth Based religion is one of our sources, and on this day we honor the cycle of the seasons & the return of the light. Making BFF cards. These laminated cards remind us to (B)reathe (F)ocus (F)eel during times of stress. When we can understand the workings of our minds and bodies, we are better able to practice our principles. We now have two wonderful people on staff to help children with accessibility needs. Please email re@uucqc with questions, or if you’d like to set up a meeting to plan how best our program can meet the needs of your child. Since September, the 7-12th grade YoUUth group has been busy! Filled with games, activities and laughter, year begun with an overnight retreat to a Maquoketa Youth camp. In the months following, the group met weekly, participating in exercises and activities which strengthened their understanding of UU principles and their intersection with social justice issues. Along with classroom discussions, the YoUUth group facilitated the setup, running and tear down of the Halloween Carnival, raised over $275 in funds to support the Sanctuary Project during Soup Sunday, attended a group showing of the film The Hate U Give and several teens choreographed and/or directed the dance and play for the Intergenerational Holiday Service. As 2019 begins, the YoUUth group is excited for their upcoming overnight Lock-In, Youth-led service and additional activities. The teens demonstrate outstanding passion and leadership as they continue to live their UU faith through social justice activism, engagement and community empowerment!